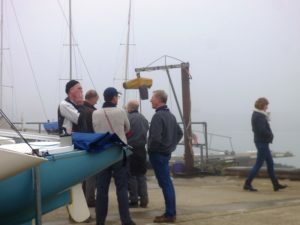 Thick mist and no wind greeted the twelve Illusion sailors as they gathered on the Illusion Park on Saturday for the first day of the Stratton Memorial Trophy. 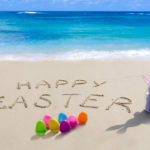 However with the forecast suggesting that the breeze should pick up a bit and the sun should eventually burn off the mist, it was decided to rig up and wait to see how things evolved. In the event, a wise decision as a light Easterly breeze did materialise and the mist did clear a bit and by keeping to the harbour, at least no one got lost! With the windward marks just visible from the start line, the first race, after a 45 minute postponement, got away to a clean start. Bruce Huber, having managed to get through the fleet on port tack was first to round the windward mark. Mark Downer was second with Robin Ebsworth and Andy Christie close behind. By the third run to the leeward gate, Bruce had developed a substantial lead; Mark was second and Alastair Speare-Cole had worked his way into third; disappointingly (for them anyway) Robin and Andy were also over taken by Jo Downer, Alex Downer & Mike Toogood (who finished within inches of each other) and had to be content with seventh & eighth. The start of the second race had Bruce, Mark & Robin called OCS; all came back and although Robin struggled to catch up, Bruce & Mark were soon back in contention. Jo, Mike & Andy were the first to reach the windward mark and lead the fleet back to the leeward gate. On the second round, Bruce edged his way into the lead with Mark not far behind and it looked as if that was going to be the order at the finish, however as they closed on the leeward gate for the third time, Mark found some extra boat speed and was able to call for water on the favoured gate mark and crossed the finish line a couple of boat lengths ahead. Jo was third and Alex was fourth. At the other end of the fleet, Robin Ebsworth & Philip Russell finished within inches of each other and Mike Issaias and Charles Nainby-Luxmoore were so close that they were scored equal eleventh. 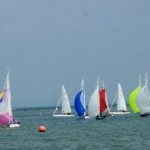 With visibility improving, and even a bit of sunshine, the course had to be re-set before the third race could get underway when the light breeze veered to the South East. After another good start, it was Bruce’s lime green spinnaker that was first to appear on each of the runs and although he was well ahead it was nevertheless good to see Philip, Jo and Andy leading the chasing pack. Mark joined them on the second round but then missed the windshifts and found himself stuck in the middle of the fleet. Unfortunately the breeze went even further right as the race progressed and the final leg back to the finish at the windward mark turned into a single tacker for most. Jo & Andy had a very close finish with only inches between them. 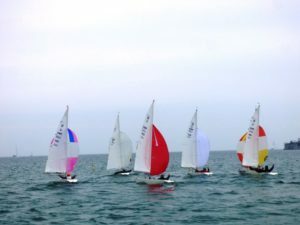 With no mist and a F2-3 Southerly on Sunday morning, the standard windward/leeward course was set up just outside the harbour off Silver Beach. It was particularly good to see David Peerless back racing following a skiing injury at the end of last year, so although there were a couple missing from the previous day, David and Simon Irwin made up the numbers. After a short postponement to allow for the windward marks to be adjusted slightly as the breeze backed slightly, the start of the first race of the day was a good one with no one crossing the line early. Bruce was first to the windward mark with Alastair, Jo and David not far behind. On the run to the leeward gate, Bruce extended his lead and Mark moved up to second just ahead of Alastair, Jo and David. There was little change in the third round at the top end of the fleet; Bruce finished well ahead of Mark with Alastair some way back in third. David just squeezed home ahead of Jo to take fourth. Mid-fleet, Andy Christie and Robin Ebsworth were less than a second apart. Despite Bruce & Mark (and Philip Russell) having to come back after over cooking the start of the second race, it was not long before they were back at the front of the fleet. 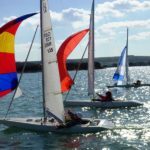 Alastair was first round the windward mark but then had a problem with his jib sheets which slowed him down a bit and allowed Mark. Jo & Bruce to overtake him as the race progressed. There was nothing in it between Mark & Bruce as they rounded the windward mark for the third time, however by the time they reached the finish they had been split by Mike Toogood who had a great race and finished second just in front of Mark. Jo was third. The start of the last scoring race of the day was another cracker with the majority of the fleet only feet behind the line. Mark was the first to round the windward mark, with Bruce & Robin close behind, however as the race progressed, Bruce edged into the lead again and by the finish he and Mark were well ahead of the rest of the fleet. Although there was little in it and places changed on each round, third place eventually was taken by Philip with Alastair and Mike close behind.